The Volkswagen New Beetle made its unofficial racing debut at the 24 Hours of Nurburgring 12-14 June, 1998. 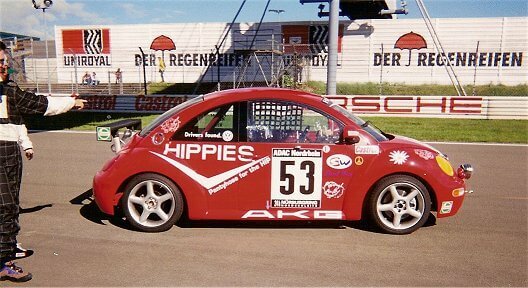 The #53 “Hippies” New Beetle was constructed by AKG Motorsport to the 24 Hours of Nurburgring’s Group 5 specs. The entire project was realized within a month, despite the lack of cooperation from Volkswagen itself, who was discouraging imports of the car into Germany (the New Beetle was not scheduled for release there until Fall of ’98). The car is owned by Ross Palmer, Australian entrepreneur and producer of the PROCAR Australia Production Car series. The Hippies New Beetle attracted plenty of attention and media coverage before the 24 Hours of Nurburgring (including a photo op with the original “Love Bug”), then campaigned a successful race on the famous 14-mile German circuit. Despite a run-in with a barrier and subsequent intercooler troubles, the car finished 131st, a strong showing for such a newly-minted car. The all-Australian driving team headed by Palmer also included Melinda Price, Peter McKay, and Damien White. Read the Dune Buggies and Hot VWs article (pdf) for more details. Ross Palmer and Melinda Price campaigned the New Beetle again that year, at the Nurburgring 6 Hours VLN, this time accompanied by Sir Jack Brabham – in his first return to the old Nurburgring circuit since 1970. 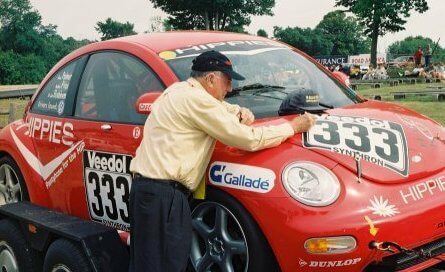 Sir Jack and the New Beetle met again at Road America several years later. Take a look at our Gallery of New Beetle photos.